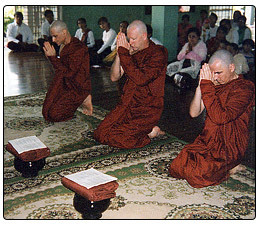 The ordination procedure for Buddhist monks, know, as the 'Going forth', begins with the applicant's formal request (Pabbajja) to a senior monk or bhikkhu for the novice (samanera) ordination. 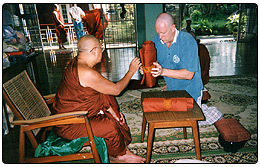 On receiving permission, the applicant prepares for the ceremony by acquiring a complete set of robes and getting the help of the monks in the monastery to shave his head. Then he approaches the senior monk and pays his respects by bowing three times and hands over the robes saying a passage prescribed for the purpose. Then he formally asks the senior monk to give him the robes, and having received them he is helped by the monks to put them on. The applicant then makes a formal request for the novice ordination. The senior monk acquiescing administers the Three Refuges and the Ten Precepts or training rules. Venerable Sir, I respectfully ask you to take this set of robes in my hand and out of compassion ordain me as a novice in order that I may be free from the cycle of existence. Venerable Sir, I respectfully ask you to give me the set of robes in your hand and out of compassion ordain me as a novice in order that I may be free from the cycle of existence. Venerable Sir, I respectfully ask you to ordain me as a novice in order that I may be free from the cycle of existence and attain Nibbana. (I undertake to abstain from harming or taking life). (I undertake to abstain from taking what is not given). (I undertake to abstain from any sexual contact). (I undertake to abstain from false speech). (I undertake to abstain from the use of intoxicants). (I undertake to abstain from taking food after midday). (I undertake to abstain from dancing, singing, music or any kind of entertainment). (I undertake to abstain from the use of garlands, perfumes, unguents and adornments). (I undertake to abstain from using luxurious seats). (I undertake to abstain from accepting and holding money). Finally, as a novice, he requests the senior monk to be his Preceptor and on being accepted he receives a new name in Pali. Venerable Sir, would you kindly be my preceptor? In the Buddhist monk's code of ethics, the Vinaya, the Buddha decreed that a condition for higher ordination is that the candidate has a Preceptor. Accordingly, at the time of his novice ordination the candidate begged the senior monk to be his Preceptor; the senior monk agreed to do so, and thus the applicant has a preceptor to guide him so long as he remains a bhikkhu in the Buddha's dispensation (Sasana). This is your alms-bowl. (Indicates each item) This is your outer robe. This is your upper robe. This is your inner robe. I have now ascertained that you have a complete set of robes and an alms-bowl. The Assembly will give you and your preceptor new names in order to read the "The Motion and the Three Announcements" (Kammavaca) easily and to show respect to the preceptor. Your new name is Naga and your preceptor's name is Venerable Tissa. The Assembly of the Sangha (community of monks) will use the name Naga for the applicant and Venerable Tissa for the preceptor. These two names will be used in the course of the ceremony for this bhikkhu ordination. Please listen to me, Naga, now is the time to instruct you on how to answer the questions that will be put to you by the Assembly. It is not, however, correct to instruct you in the middle of the Assembly - therefore, I will instruct you outside of it. Please stand up, Naga, and go backwards with your palms together in the 'prayer posture' thereby paying respects to the Assembly of the Sangha. Then stop at a place about twenty feet from the Assembly and stand there. Please listen attentively, Naga, now is the time for you to be honest and tell the truth. When you are back in the middle of the Assembly of the Sangha you will be questioned concerning any hindrances regarding your eligibility for higher ordination. Answer truthfully and according to the facts, do not be at a loss, do not be embarrassed. You are just to answer 'yes' if it is true or 'no' if it is not. 1. Do you suffer from leprosy? If you do, answer 'Yes, Venerable Sir', if you do not, answer 'No, Venerable Sir'. 10. Have you got your parents' permission to be ordained? 11. Have you a set of three robes and an almsbowl? I have instructed you, Naga, on how to answer the questions that you will be asked when you are back in the Assembly. I am now going to the Assembly alone, you are to remain here and come to the Assembly only when you are called. Then the senior monk returns to the assembly, bows, and says: "May the Sangha hear me. The candidate, Naga, under the Venerable Tissa, has been examined. If the Sangha is willing may he be allowed to come forward." "Now is the time for you, Naga, to request the Sangha to ordain you a bhikkhu. Your request should be both in Pali and English". At the command to come the novice approaches, bows three times, kneels with hands together, says. Ullumpatu mam bhante Sangho anukampam upadaya. "The novice Naga is an initiate whom I sponsor and he wishes to enter the monkhood before this Sangha. I invite the Sangha to examine this novice by asking the antarayikadharma of him (obstacles to entering the Order). He knows the prescribed form of the higher ordination (Upasampada) ceremony. Let us agree to conduct the ceremony with the prescribed kammavaca form (The Motion) together with the threefold announcement in order that nothing be amiss." Please listen carefully, Naga, now is the time for you to answer clearly, do not be at a loss, do not be embarrassed. On behalf of the Sangha I will ask you questions that will assess your eligibility for the bhikkhu ordination. You are just to answer 'Yes' or 'No' Venerable Sir. May the Sangha hear me. Naga the pupil of Venerable Tissa is free from the Eight Obstacles. He has his robes and bowl. Naga begs admission to the Sangha. If the members of the Sangha assembled here are ready they should admit Naga to the Sangha. Venerable Tissa is his Preceptor. This is the prescribed manner. May the Sangha hear me. Naga is the pupil of Venerable Tissa. He is free from the Eight Obstacles. He has his robes and bowl. He begs admission to the Sangha. May the Sangha admit Naga. Venerable Tissa is his Preceptor. Let those who are agreed keep silent. If anyone does not agree let him speak out. For the second time I speak. May the Sangha hear me. (a repetition of the above) For the third time I speak. May the Sangha hear me. (a repetition of the above) Let those who are agreed keep silent. If anyone does not agree let him speak out. The Sangha is silent, therefore Naga is admitted to the Sangha. Venerable Tissa is his Preceptor. The Sangha is agreed, therefore is silent. I too become silent. With these words the ordination as a service of admission to the monkhood is concluded. Either immediately following this or some time later, the newly admitted monk to the Order is given instruction concerning the life of the bhikkhu.